Groundnut (Arachis hypogaea L.) is an important oil seed crop of India. It has great potential for diversification to food uses due to its nutritive virtues. One of the major impediment for diversification is aflatoxin contamination. Aflatoxins are the toxic substances produced by strains of fungi belonging to Aspergillus flavus and A. parasiticus. The present study was undertaken during the 2005-06, rainy season in Junagadh, Gujarat, India to assess the adoption gaps in aflatoxin management practices of groundnut (AMPG) and the farmers characteristics influencing this gap. The district was selected because it was identified as one of the high risk area for aflatoxin contamination in rainy season. The results indicated that majority of the farmers were in high adoption gap category as most of the farmers had not adopted the harvest and post-harvest management practices. Farmer's characteristics knowledge, market orientation and innovativeness influenced the adoption gap significantly. Based on the results, it is suggested to formulate strategies to increase the knowledge of farmers through various extension approaches. The selection of innovative farmers for groundnut production and differentiating the contamined and afltoxin free groundnuts by the markets will help in reducing the adoption gap. Key words: Groundnut, Aflatoxin contamination, Aflatoxin management, Adoption gaps. India is the largest producer of groundnut (Arachis hypogaea L.) in the world, comprising 35% of global area and 28% of production, whereas Africa accounts for 35% of area but, 21% of production (Freeman, Nigam, Kelley, Ntare, Subrahmanyam & Boughton, 1999:3). Groundnut is the most important oilseed crop in Gujarat State, India, and grown in an area of 1.9 million ha with a production of 1.5 million t. Groundnut is a major crop of Junagadh district of Gujarat. It is cultivated by all types of farmers in different types of soils, mostly during rainy season (June-July to September-October). The average area and production in the district is 0.37 million ha and 0.39 million t of groundnuts, respectively with an average yield of 1024 kg/ha (Sahu & Patoliya, 2005:49). Groundnut plays an important role in the diets of rural population of the district, because of its high contents of protein (21-30%), fat (4152%), and carbohydrate (11-27%). It is also rich in calcium, potassium, phosphorus, magnesium and vitamin E. Groundnut haulms are nutritious and widely used for feeding livestock (Waliyar, 2006). Eighty per cent of groundnut production is utilized for oil extraction and only 10% is used for direct human consumption in the state. There is great potential for direct consumption of groundnut and groundnut-based products due to its high nutritive value (Basu, 1997). The major impediment to diversify groundnut from oil extraction to food purpose is the aflatoxin contamination. Aflatoxins are the toxic substances produced by strains of fungi belonging to Aspergillus flavus and A. parasiticus. Since, early 1960's aflatoxin contamination has led to human and cattle health concerns, significantly influencing groundnut trade worldwide. It is considered to be one of the important causes of hepato-cellular carcinoma, one of the most common cancers in developing tropical countries. Groundnut can be contaminated with aflatoxin at various stages before harvest, during harvesting, field drying, curing and in storage. Afaltoxins are the major toxins affecting the quality of groundnut meant for human consumption. As the future of groundnut lies in its use as a food crop by itself and in a variety of food products that are widely consumed, widens the health risks of aflatoxin contamination (Waliyar, 2006). Several national and international institutes have carried out research on aflatoxin management, and developed technologies, which can significantly reduce contamination, but the adoption of these technologies by farmers is far less than the expected level. (Kumar, Thakur, & Desai, 2001:37 and Kaya & Harris, 2003:24). The role of socio-economic factors for this non-adoption were not studied by the researchers. Furthermore, Junagadh district is identified as one of the high risk area for the aflatoxin contmaination during the rainy season (NRCG, 2004). Hence, the present study was undertaken during 200506, rainy season with an objective to assess the adoption gaps in aflatoxin management practices of groundnut (AMPG), and the farmers characteristics influencing this gap. The study used an expost-facto research design and multi-stage random sampling was followed. In the first stage, out of fourteen talukas of Junagadh, three were selected based on the highest area, production and aflatoxin contamination of groundnut. In the second stage, three villages were selected by random sampling from each taluka, making a total of nine villages. Seperate, village-wise lists of groundnut farmers were prepared for the nine villages with the help of village level worker and gram panchayat staff. In the final stage, 20 farmers were selected from each village by random sampling. Thus, the total sample size was 180, which consituted approximately 0.18% of groundnut farmers of the district. The characteristics, which may influence the adoption gap such as knowledge of aflatoxin AMPG, perception of quality of groundnut, socio-economic status (SES), age, farming experience, extension participation, market orientation, economic motivation and innovativeness were selected for the study. To measure the knowledge and adoption gap of AMPG suitable scales were developed. The scales consisted of statements, pertaining to pre-sowing, sowing, post-sowing, harvest and post harvest practices of aflatoxin management. The relevancy of statements of the scales was ascertained by thirty experts from Junagadh Agricultural University (JAU), , National Research Centre for Groundnut (NRCG) and Gujarat State Agriculture Department (GSAD). Final knowledge test consisted of 32 statements and adoption scale consisted of 22 statements. The respondents responses were recorded as correct/incorrect or yes/no against each statement. A unit score was given to correct/yes answer and zero to incorrect/no answer. The total score obtained by the respondent for all the statements was summed up which, gave the individual respondent's score. The adoption gap (AG) of AMPG and practice-wise adoption gap were computed. The AG for each farmer was defined as the proportion of practices not adopted to total reccommended practices of aflatoxin management expressed in percentage. The following formula was used to compute AG. The practice wise adoption gap (PAG) was the proportion of respondents, who had not adopted the particular practice to the total number of respondents expressed in percentage. To measure the farmers' perception of quality of groundnut, a scale was developed based on the guidelines of Likert, 1932; Edward, 1957 and Patil, Swamy & Patil, 1996. The scale consisted of 22 statements, with responses and scores on a five point continum ranging from strongly agree = 5, agree = 4, undecided = 3, disagree = 2, and strongly disagree = 1. The scores obtained by individual respondent for all the statements were summed up to obtain the individual perception score. The SES of respondents was measured by developing a scale which consisted of nine main items and 48 sub-items. The individual respondent score was obtained by summing up the scores of all subitems. The farming experience was measured based on the guidelines of Bora (1986), extension participation based on the scale of Siddaramaiah and Jalihal (1983), market orientation (Samantha, 1977), economic motivation (Moulik & Rao, 1965) and innovativeness was measured by developing a scale based on the guidelines of Nandapurkar, 1982. An interview schedule was designed based on the objectives of the study for data collection, which included all the scales. The content validity of the schedule was established by the experts from JAU, NRCG,GSAD. The schedule was translated to gujarati language taking due care not to loose any information. The schedule was pre-tested on 40, non-sampled respondents and necessary modifications were made. Data were collected through personal interviews of the respondents. Descriptive statistics such as percentage (%), mean, standard deviation, and frequency (f) were calculated. Spearman's product moment correlation and stepwise regression were estimated. Davis conventions (Joe & Heather, 2003) were used to ascertain the magnitude of relationship of correlation. It was observed from Table 1 that 60% of the sampled farmers were in high and very high AG category indicating low adoption of the recommended AMPG. This can be attributed to the fact, that the market has neither rejected contaminated produce, nor provided incentives to contamination free produce. There was no hindrance for the sale of contaminated groundnut in the local markets, as there was no resistance from the ultimate consumers of groundnut. This was due to the lack of awareness on the part of both farmers and consumers on the ill-affects of consumption of aflatoxin contaminated groundnuts. The PAG ranged from 6-86 % indicating the low adoption of different recommended practices of aflatoxin management. 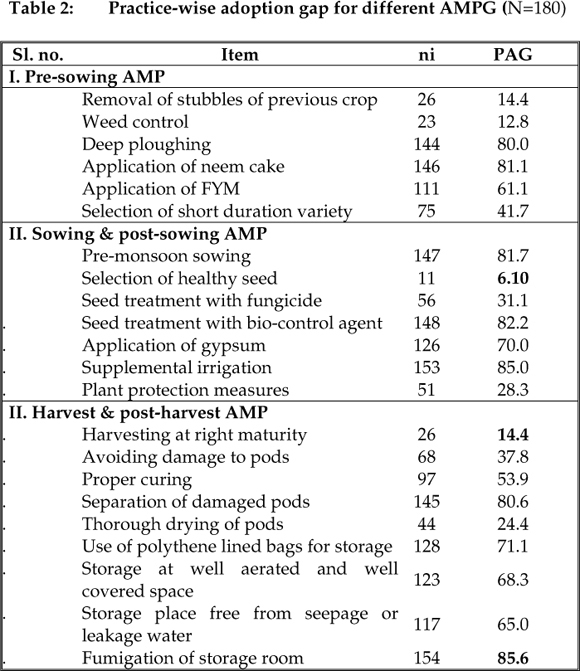 The highest adoption gap existed in fumigation of storage room, followed by supplemental irrigation, seed treatment with bio-control agent, pre-monsoon sowing, application of neem/castor cakes, separation of damaged pods, and deep ploughing. The adoption gap was low for important practices such as selection of healthy seed, weed control, and removal of stubbles of previous crop. This clearly indicated that low cost/no cost and feasible technologies were readily adopted by farmers compared to input intensive, high cost and labour intensive technologies. In pre-sowing practices high adoption gap was observed in the application of neem cake and deep ploughing, which are input & labour intensive and high cost practices. In sowing and post-sowing practices, the high adoption gap was observed in pre-monsoon sowing and supplementary irrigation, which were mostly monsoon dependent. Further, high adoption gap was observed in the harvest and post-harvest practices ranging from 14-86%. These practices, significantly influence the aflatoxin contamination, but were not adopted by the farmers. These results were in congruity with the results of Devi & Hall, 2005 wherein the group found that farmers had not adopted the recommended AMPG. 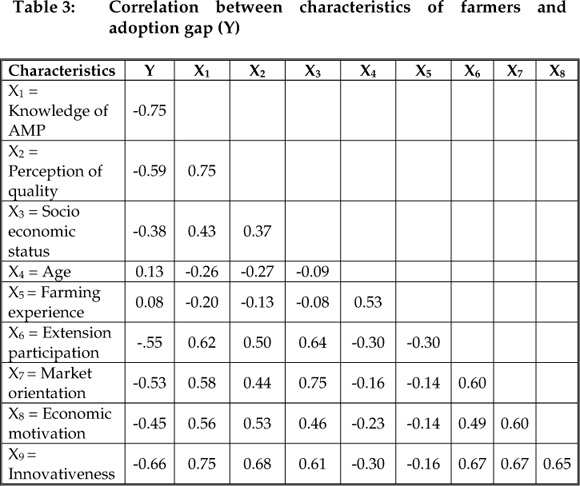 The correlation between farmers characteristics and the adoption gap were estimated to ascertain the association (Table 3). Based on Davis conventions, very strong association was observed between adoption gap and knowledge, whereas substantial associations were observed for innovativeness, perception, extension participation, and market orientation. Moderate association was seen with economic motivation. Low and negligible associations were seen with age, and farming experience, respectively. The associations were negative in direction, indicating the probability of increase in adoption gap, due to decrease in magnitude of farmers characteristics, except age and farming experience. The correlation between the characteristics indicated a very strong association between knowledge and perception, knowledge and innovativeness, SES and market orientation. The results clearly indicated that knowledge and innovativeness has a strong influence on adoption gap. Prior to regression analysis, inter-correlations were calculated to check for multicillinearity among characteristics. Multicollinearity is shown by very strong correlations between the characteristics indicated by coefficients of 0.80 or above (David, 1970). After ascertaining the absence of multicollinearity, the relationshop between the characteristics and adoption gap was estimated using stepwise regression analysis (Table 4). Three characteristics were found to explain adoption gap of AMPG. The characteristics explained 59% of the cumulative variance, R2, in adoption gap. The knowledge of AMPG accounted for the greatest variance (56%), innovativeness explained three per cent, and market orientation explained one per cent. The estimated value of adoption gap, when each characteristic was zero (intercept or constant) was found to be 19.72. The adjusted R2 was found to be 58%. The other characteristics such as perception of quality, extension participation and economic motivation have strong relation with AG. But, they were not statisfically significant in stepwise regression analysis, indicating nonsignificant cause-effect relationship with AG. The knowledge on AMPG has evolved as an important characteristic of farmers which is significantly influencing the adoption gap. Hence, strategies are to be formulated to increase the knowledge of farmers on AMPG through various extension approaches such as individual contacts, group discussions, farmers trainings particularly post-harvest handling. A systematic institutional mechanism has to be developed wherein all the stake holders: farmers, traders, extension personnel, input dealers, and research personnel should have constant interaction and sharing of knowledge on AMPG. The innovative farmers had to be identified by the various departments concerned with groundnut production for production of aflatoxin free and good quality groudnuts. The markets had to be oriented to provide differential prices for the aflatoxin free and aflatoxin contaminated groundnuts to discourage production of contaminated groundnuts. Mass awareness campaigns are required, to educate farmers and consumers of groundnuts and groundnut products regarding the ill-effects of aflatoxin contamination. Providing incentives to farmers and building up of consumer demands for aflatoxin free groundnuts will go a long way in reducing the adoption gap in aflatoxin management of groundnut. The findings of the study indicated that the role of the farmers in the whole system is more on the receiving end as 'passive subjects' rather than 'active stake holders' despite the fact that groundnut crop constitutes one of their main sources of livelihood in the district. Farmers' socio-economic conditions indicated a complex situation where several factors are at interplay. Strategies to reduce aflatoxin contamination in groundnut need to be evolved to fit the resources and livelihood systems of farmers. Farmers worked under several socioeconomic constraints which had become their primary concern before they were prepared for any changes to the current management practices, the new technologies should be less input intensive, low cost, and less labour intensive. The results indicated that majority of the farmers (60%) were in high AG category with respect to afltoxin management practices. The PAG ranged from 6-86% and most of the harvest and post-harvest practices were not adopted by farmers. In pre-sowing practices high AG was observed in application of neem cake and deep ploughing, which were input & labour intensive and high cost practices. In sowing and post-sowing practices, the high AG was observed in pre-monsoon sowing and supplementary irrigation, which were mostly monsoon dependent. Farmer's characteristics such as knowledge, market orientation and innovativeness influenced the adoption gap significantly. Based on the results, strategies are to be formulated to increase the knowledge of farmers through various extension approaches. Mass awareness campaigns are required, to educate farmers and consumers of groundnuts and groundnut products regarding the ill-effects of aflatoxin contamination. The innovative farmers had to be identied by the state department of agriculture/extension wings of the development departments for producing aflatoxin free groundnuts. Providing incentives to farmers and building up of consumer demands for aflatoxin free groundnuts will go a long way in reducing the aflatoxin contamination of groundnut.